You are here: Home / Cancer Prevention / Opioid Overdose Epidemic Sweeps U.S.
A new report has found that, for the first time, Americans are more likely to die of an opioid overdose than a car accident. The increase is directly and significantly associated with marketing efforts of the pharmaceutical industry. As the truth begins to surface, pharma execs are finally being put on trial for their contributions to one of our nation’s greatest health crises in a generation. More than 100 people die every day from an accidental opioid overdose, and 40% of those deaths are from prescription painkillers. But prescription opioid drugs are responsible for the vast majority of these deaths since most people become addicted to prescription drugs before transitioning to more illicit opioids like heroin and fentanyl. Companies like Purdue Pharma, the creators of OxyContin, have been charged with misleading doctors regarding the dangers of these powerful painkillers, but that hasn’t stopped the industry from aggressively marketing highly addictive opioid drugs to doctors all over the country. In 2011, NPR published an article about addiction to Oxycodone, one of the most common opioid prescriptions in the United States. Florida doctors prescribed 10 times more oxycodone than the rest of the country combined. Over the past 10 years, a West Virginia town with just over 3,000 residents has been flooded with opioid drugs – over 21 million, to be precise. That’s about 6,500 pills for each resident. A 2014 survey by the Substance Abuse and Medical Health Services Administration found that there are over 4 million non medical painkiller users. In fact, over 10% of Americans had used an illicit drug within 30 days of the survey. And those trends have only increased in recent years. In 2017, 47,600 people died from an accidental opioid overdose, almost double the numbers from 2010. The problem has become so bad that Americans have a 1 in 96 chance of dying by accidental opioid overdose. Those are higher odds than deaths from car accidents, falls, gun assaults, drowning, or fires. Opioid overdose is now the number one cause of accidental death in the nation. Life expectancy has declined in recent years, due to a spike in preventable deaths, like overdosing. This flood of addictive drugs over the past decade was dispersed not by shady drug dealers, but by licensed physicians who wrote prescriptions at an alarming rate. In 2017, there were more than 58 opioid prescriptions for every 100 Americans. And that’s almost 20% less than it was just a decade ago. From 2008 to 2012, doctors wrote more than 80 opioid prescriptions for every 100 Americans. The pharmaceutical companies profiting from these drugs and the regulatory bodies responsible for them have utterly failed us. And after years of pumping prescription poison into every corner of the nation, the use of illicit drugs has skyrocketed. It is not an overreaction when I tell you that the opioid crisis is a national catastrophe. And like most catastrophes stemming from the pharmaceutical industry, it’s been fueled by greed. Pharmaceutical companies have long been accused of deceptive marketing tactics. They’ve spent billions of dollars on direct marketing to physicians. About 3 of every 4 doctors have financial ties to big pharma, receiving money, meals, consulting fees, and other gifts from drug reps. I reported a few months ago about an orthopedic surgeon who received nearly $2,000,000 from companies who manufacture hip and knee replacements. There’s little doubt that the billions of dollars that pharmaceutical reps spend on physician marketing has a significant influence on doctor behavior. These companies have also been accused over and over again of misleading doctors. Since the introduction of OxyContin, doctors have been repeatedly told that the drug is safe and effective, despite overwhelming scientific evidence that says otherwise. But until now, there have been no studies that clearly show a connection between pharmaceutical marketing and the opioid epidemic. 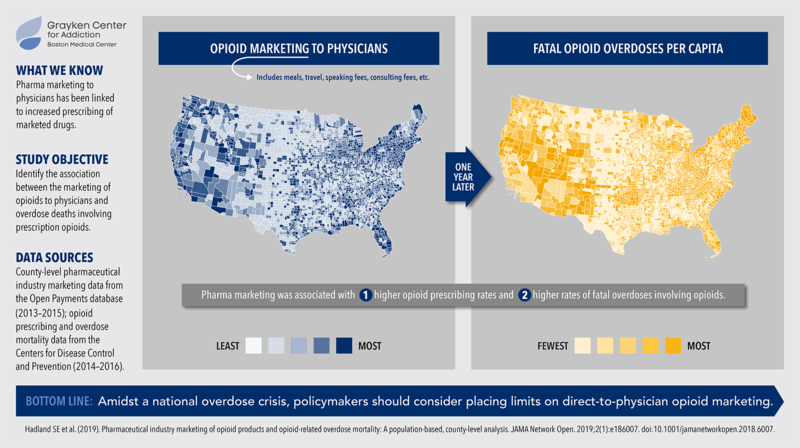 In the study published in the JAMA Network Open this month, researchers found that marketing of opioid products to physicians was associated with increased opioid prescribing and elevated mortality from overdoses. Between 2013 and 2015, about 1 in 12 doctors received opioid-related marketing. For family physicians, roughly 20% received opioid marketing. From August 2013 to December 2015, the study found that there were 434,754 payments totaling $39.7 million in opioid marketing. Those payments were made to 67,507 different physicians spread over 2208 U.S. counties. This is an average of 6.44 payments averaging $90.32 per physician. What’s especially interesting is that the number of gifts affected opioid mortality more than the value of those gifts. 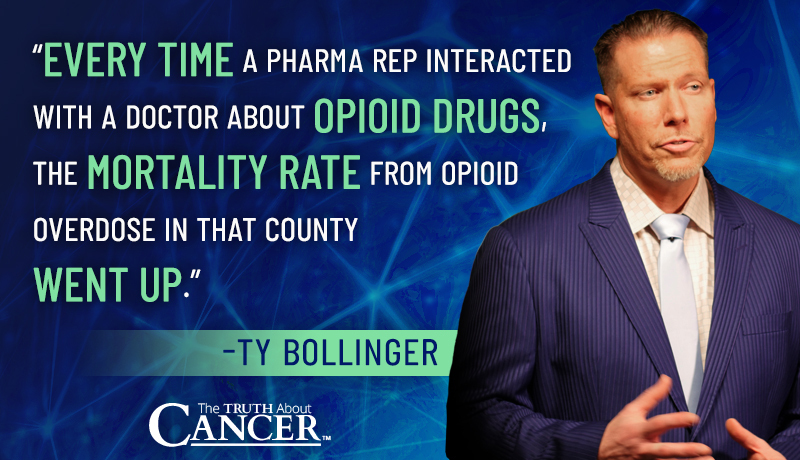 In other words, every time a pharma rep interacted with a doctor about opioid drugs, the mortality rate from opioid overdose in that county went up. This direct marketing of opioids to physicians costs the pharmaceutical industry tens of millions of dollars each year and is directly and significantly associated with overdose mortality. The authors acknowledge that the association could be interpreted in reverse. It’s possible that pharmaceutical reps have been targeting doctors who already prescribe more opioids, though this explanation seems less likely. Plus, the idea that sales reps for opioid products are targeting counties with elevated opioid overdose mortality is considerably more sinister than the original conclusion. Manufacturers should care about the wellbeing of patients and do everything in their power to inform physicians of the addictive nature and severe danger of these drugs. But there’s too much money to be made. And that’s why pharmaceutical giants continue to pay tens of millions to doctors who prescribe their drugs. The more opioids a doctor prescribes, the more money he gets from the manufacturer. It’s not just morally corrupt; it’s criminal. Fortunately, we’re beginning to see a significant shift in the way U.S. regulators and courts treat pharmaceutical companies who practice fraudulent and unethical marketing practices. In 2007, Purdue Pharma saw three of its executives convicted of criminal misbranding. 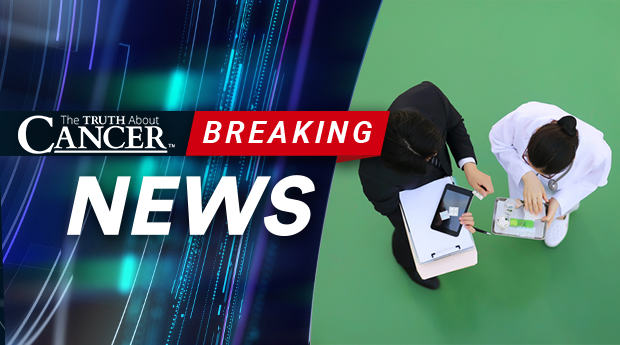 Purdue Frederick, a holding company for Purdue Pharma, pled guilty to felony charges for telling doctors that OxyContin was safer and would cause less abuse and addiction than other opioid drugs. Yesterday, Reuters reported that John Kapoor, the founder and former chairman of Insys Therapeutics Inc., would face charges of conspiracy and bribery for a kickback scheme involving their powerful new opioid drug. Four more former executives will join Kapoor in going to trial for allegations that the company paid doctors to prescribe Subsys, an oral fentanyl spray intended only for treating severe pain in cancer patients. More than 100 times stronger than morphine, fentanyl is a large contributor to the skyrocketing rates of opioid overdose in the United States. It’s important to remember that most people addicted to illicit opioids were first introduced through prescription pain killers. Those who use drugs like heroin or fentanyl most likely got their start using drugs like OxyContin and Percocet. Insys’ former CEO and vice-president of sales have both pled guilty to carrying out the illegal scheme. As state’s witnesses, they say that they worked under Kapoor’s direction in order to boost sales of the powerful opioid drug. In addition to bribing doctors, the executives are also accused of defrauding insurers, by making them pay for drugs that were fraudulently prescribed. There’s a lesson here, and it’s one that bears repeating loudly and often: Money runs the pharmaceutical industry. These drugs have become the leading accidental cause of death, and doctors continue to take money from drug reps, despite the body count climbing into the tens of thousands each year. In an article covering the financial ties between doctors and pharmaceutical sales reps, we shared a way for you to know just how much influence big pharma has had on your doctor. Since 2013, federal law has required that payments to doctors by medical device and pharmaceutical companies be publicly reported. The database (which you can access here) has published over 11.5 million records between August 2013 and December 2017. Politicians on both sides of the isle have begun to pay more attention to the pharmaceutical industry and their practices regarding opioid sales. In 2017, the president declared the opioid crisis to be a public health emergency. In October of last year, the Attorney General demanded that medical boards “be more aggressive” when it comes to investigating and punishing doctors who prescribe opioids frivolously. These opioid drugs are a scourge on our nation. Be sure to talk to a holistic health practitioner about natural options to manage pain. There are many natural ways to manage pain, and they can be especially helpful for those dealing with side effects from conventional cancer treatments like chemotherapy and radiation. Doctors, like any of us, can be corrupted by money and gifts. Don’t let the pharmaceutical industry turn you into their next victim. Before you fill that latest prescription, be sure you know who’s really pulling the strings. This is wonderful to hear! God bless you! Opioid dependence is now common knowledge, but 7 years ago, my 80 year old Mom was given oxycontin pain relief after a car accident (and was already being treated with epidurals for lumbar spinal stenosis, spondylolisthesis, severe arthritis, and scoliosis). Sadly, her pain doctor, who was probably lied to by the pharmacy reps, continued her on the oxycontin after the incident. She never drank, smoked and was always a healthy eater. She has been wanting to taper off 20 mg oxycontin twice a day, but the doctors just say “stay on since you are doing OK with it”. The pharmacists say “ask you doctor’. We went to 3 pain doctors to try to get help and they are not interested. It’s dangerous to cut the extended release oxycontin to try to taper down. Where is information on helping a person who wants to get off this drug available? How can she try the medical cannabis tincture (Pennsylvania) while trying to taper off this nasty dependence? I’d love to see real patients that have successfully tapered off oxycontin when they have chronic pain due to arthritis and back deformities (and over 80). Please do feel free to reach out to any one of these doctors as they are more than competent in providing natural alternatives to conventional treatments. If we can do anything else to help please don’t hesitate to reach out to us. Love and blessings to you and your mother! I know of something that really would help…it is called Mitragyna aka Kratom…that kills pain makes you feel good and is a great help to come off Opiods….do some research on this herb from South America. Addiction is minimal…if you do not live on it. Great for anxiety too. You use a marijuana rub Salve that is called papa and barkleys…sold at dispensaries but i make it at home with beeswax coconut oil and cannibis with some essential oils. Super easy and after 17 years on oxy 80 mg and fentanyl 75mgs i was able to stop in one month!!! Magnesium chelated with vitamin d 10000 units per day and silver hydrosol and pine hydrosol.kept us all well..healed and thriving. Will the doctors at least switch your mother to non-extended release tablets? That way she could start slowly weaning off the Oxycontin. Look up Thorny Paw pain relief cream. It’s an all natural herbal cream that has no chemicals and works great. For Ty and Charlene, in the book of Revelations chap. 18verse 23, the word sorcery is translated from the creek means pharmakeia. How interesting hey. What your option on this? There have also been some major problems with some horse vaccines. Everyone knows powerful painkillers are still opiate based and can be addictive if abused or used over extended periods beyond which they were intended. Can you really blame the manufacturers or the doctors if they prescribe powerful painkillers for extreme pain. Addiction of all types is on the up, alcoholism, antidepressants and recreational drug abuse. These are soaring as society is unravelling, and people are getting left behind industry and jobs, property prices, by social media and feel dissatisfied and disengaged. This is far too great and complex an issue than simply blaming ‘corrupt pharma’ you are beginning to sound like a broken record. I took tramadol for my post op pain after my colectomy in the UK but guess what? I stopped at the earliest opportunity and got back to life with my family. I didn’t wallow in self pity and keep taking them and make myself an addict. People don’t take responsibility for themselves any more always looking to blame someone else for their situation. Adrian you seem to have swallowed the Pharma propaganda that they scurrilously employed in the early days of the opiod crisis. Namely that “it’s the patients fault”. There are emails that passed between the pharma execs showing how they discussed this ploy to prevent any attempts at stopping their money train. Lucky you Adrian if you got your life back, you had the strength and possibly support to do it. It would be nice to think everyone was a carbon copy of you. But what about the people not as lucky as you Adrian without a family to get ‘back to’? Or the multitude of other varying personal circumstances that you could never in all honesty compare yourself to! Withdrawal is hard……….the perfect product some pharma execs might say. Come back to the light Adrian……I proudly thank God for Ty and Charlene’s determined ‘broken record’ as you’ve labelled it. For me they are the ‘Voice in The Wilderness’ bringing not only stunning research but love, power and support to everyone. 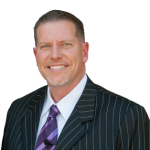 I appreciate you all so very much….still trying to get family members to listen !! Anyway…in 2014 I had a knee replacement…I have very high pain tolerance and kept telling surgeon, hospital staff and who would listen…no one did…I was physically sick after each pain pill, that did not matter to staff, they just want to manage your pain so they can release you….had surgery on Monday, went home Wednesday with prescriptions for Oxycodone, Oxycotin, and Tylenol 3…..enough to kill a horse….I was afraid to get behind the pain, imagined pain!, so I took the drugs around the clock on schedule….on Friday after taking my morning pills I just didn’t feel right so I called the surgeons office for help and staff told me “no one here to help you, its Friday and office quiet..then tried to talk to a pharmacist for help, they would not talk to me probably for liability so I called the doctors office where I had my pre-op…they did not return my call until the end of the day…..I sat all day thinking I was going to die,never realizing I should be calling 911…..finally docs office nurse called me end of day…her response “oh honey, you are way over medicated !!! DO NOT TAKE ANOTHER PILL !! !” she probably was the one to save my life !!! I never took another pill and realized I didn’t need anything and probably did not need anything once I got home from hospital on Wednesday…..I am thanking God for my life and keeping me safe that day….am still very angry about no one listening to me….I do not trust anyone …..The surgeon, who I did trust at the time, blasted his staff for their response to me but he is still probably prescribing those drugs and not listening to patients…..when my sister had her knee replacement, I never left her side during her hospital stay and questioned EVERYTHING they gave her….they still brought pills she refused just the time before…still tried to get her to take pills that she did not need ….thank you for letting me vent….still cannot get over my experience and its been 4 years !!!! I still see bugs on the walls and mice run across the floor once in awhile, halucinations, but that is passing with time…..Please don’t ever stop what you are doing…..we love you !!!!!! On the other side, there are people who suffer terribly pain from failed back surgeries who need these to even move. You should study the suicide rate of those being cut off from meds who can not bear the pain. The abusers have HURT the people who honestly need them to even move. Those who can not be treated surgically are suffering from the abusers of the meds which is unfair. There is another side of the story for the victims of wrecks, chronic pain, and failed surgeries the government and Drs are cutting off the meds as well as the pain centers for conditions noted by MRI’s and CT scans. I understand let’s delete abusers, but let’s NOT neglect those whom are suffering daily in pain. We euthanize dogs, but not people who can not stand or sit, barely make 20 steps without collapsing, leg giving without warning. From a person who suffers DAILY in misery with spinal stenosis, sciatica impinging in discs, facet hypertrophy, degenerative discs, tremors, osteoarthritis, spondolythis, back pain that has turned from one leg sciatica to both since failed back surgery and cancer to boot. This has been obvious for decades Ty. Those of us who have worked in the medical field for a long time have been well aware of it. Yes, it is big pharma, but it is the training received by doctors in schools funded by big pharma. and the blind trust and elegance of the general public. It’s also not just opioids. You have gotten the attention of the general public keep up the good work. Thank you so much for sharing this with us. We can’t imagine what a terrible experience and a rollercoaster of emotions this must have been for you and your family. Regarding your idea of creating a Truth About Statins – this is fantastic. We’ll be sure to pass this along. Thank you for sharing. Wishing you and your lovely family endless blessings, love, and good health always! Ty, thanks for your hard work! Here’s a question I’ve never had answered! How much fresh juice is a serving size that’s going to be beneficial to the body yet not too much where it is not assimilated or wasted? 8 oz? 16oz? Generally we would say that it varies by body size and type. Each body is different and depending on health and organ conditions the assimilation of fresh juice could vary. We would suggest it’s best to reach out to a nutritionist for a more individualized answer on this. Love and blessings to you and your family! I’ve been a family nurse practitioner for 19 years and one of my greatest frustrations is that it has been so difficult to get state or federal agencies to take action to stop doctors who are irresponsibly prescribing narcotics. About 10 years ago I was on a two-county committee comprised of medical providers, pharmacists, law enforcement, and a county district attorney, all coming together to try to stop one MD from over-prescribing narcotics. Eventually, the actions of our committee brought him to a stop. Last year I reported an MD to the state for prescribing approximately 2,500 narcotics per day to a small rural community. The doctor eventually found out I reported him and he had me fired immediately. We don’t intend to dismiss the fact that people are in need of pain relievers. 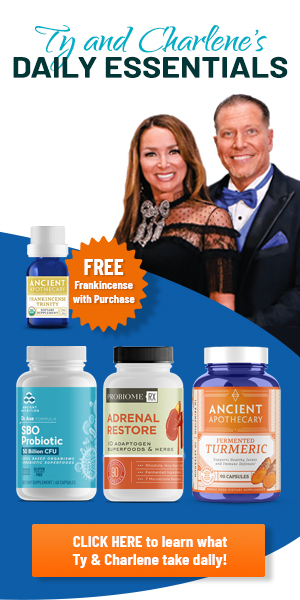 We simply want to point out that before reaching the stage of needing such extreme pain relievers at high dosages people can be guided to making diet and lifestyle changes which are contributing to the worsening of their pain. Often times people do become (understandably) addicted to the pain relievers they’re given as a “quick fix.” But there is so much more to learn about that our medical doctors don’t tell us. People aren’t even given the option of natural pain relievers or educated about the foods that can heal them from within. A patient is a human being whose health and life matters – their long term well being should be of highest priority. We try to educate people the best we can so they can learn to question their doctors and pharmacists when they’re given a quick prognosis with medication that comes with a long list of side effects. Hope this helps clarify our intention.